The 36th Annual National Veterans Wheelchair Games is about to kick off on Monday, June 27th through Saturday, July 2nd, 2016 in beautiful Salt Lake City, Utah. Hosted by the Salt Lake City Health Care System and Paralyzed Veterans of America, the entire week is filled with incredible events but what is more exciting is who is participating in the competitions. Hundreds of paralyzed veteran athletes will be traveling from all across the country (and even Great Britain) to partake in this national sporting event. The National Veterans Wheelchair Games (NVWG) was started by a partnership with the Paralyzed Veterans of America (PVA) and the Department of Veterans Affairs (VA) to get veterans more involved and active within their communities as well as benefit their mind, body and spirit. To compete, the veteran must be “U.S. military service veterans who use wheelchairs for sports competition due to spinal cord injuries, certain neurological conditions, amputations or other mobility impairments,” according the official rules of the NVWG. This year there are 19 events in the National Veterans Wheelchair Games including 9-Ball, Air Guns, Archery, Basketball, Boccia, Bowling, Handcycling, Field Events, Motor Rally, Power Soccer, Quad Rugby, Slalom, Softball, Swimming, Table Tennis, Track, Trapshooting, Triathlon, and Weightlifting. Most of the events will be held at the Calvin L. Rampton Salt Palace Convention Center in Salt Lake City and other local venues. For the second year in a row, BLVD.com is excited to support the Minnesota Paralyzed Veterans of America during the National Veterans Wheelchair Games. As a Co-Sponsor of the MN PVA with LiveAbility (Minnesota’s Complete In Home Mobility Specialists), BLVD.com will be providing media and other support to the group. Todd mentioned a very important part of the Games…the coaches. These individuals volunteer their time to assist the athletes with their equipment, help with transferring, and provide overall support throughout the competition. Each PVA group has a select number of coaches who are comprised of VA medical staff or are from other organizations. The Minnesota PVA has five coaches this year including Sue Miller, Mike Kahler, Fran Price, Daniel Cummings and Becky Wittig. The 36th Annual National Veterans Wheelchair Games is sure to be another great display of competition, courage and camaraderie. Best of luck to all the athletes this year! 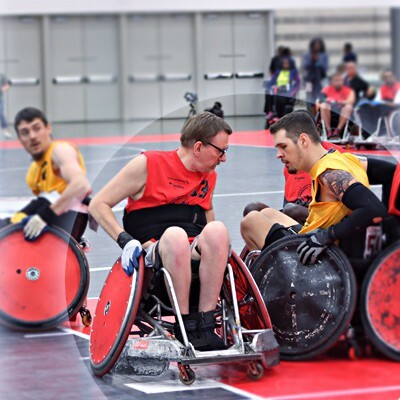 To support the veterans and the National Veterans Wheelchair Games, click here to be directed to the contact at the local PVA office to make a tax deductible donation. 100% of the donation will go to fund the operations of the Games. The Games are open and free to the public and are encouraged to come out to support the athletes during competition. For a list of events with times and locations, click here. Keep up with all the events, updates, and exciting news with the National Veterans Wheelchair Games Facebook and use #NVWG to be a part of the conversation.